Hi there! 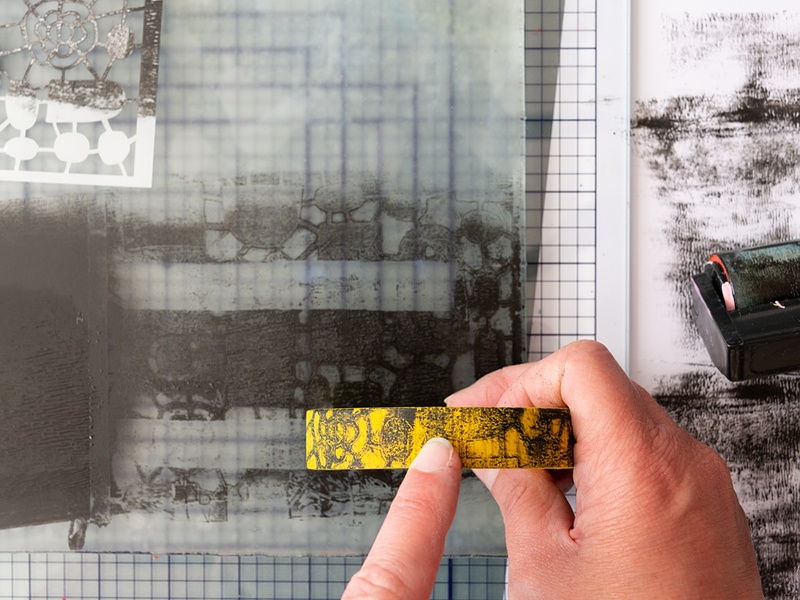 It’s Marsha Valk here today, and I’m excited to share the very first StencilGirl® Column with you! Being curious and always learning new things is a huge part of creative life. I love to go on what Julia Cameron calls Artist Dates: little solo adventures to fill up your well of inspiration. Sometimes a stroll around the block is all it takes. Other times an expedition takes me a bit further from home. And if I follow the trail of my curiosity, sometimes one adventure can lead to another. 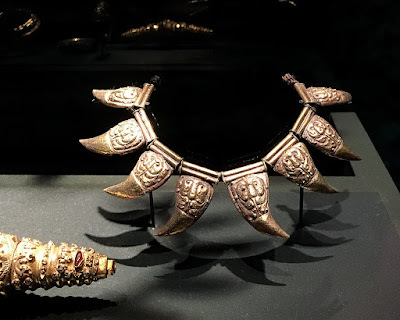 I recently went to a workshop about (fashion) accessories and how you can use jewelry, belts and scarves to your advantage when you want to emphasize or conceal certain parts of your body. 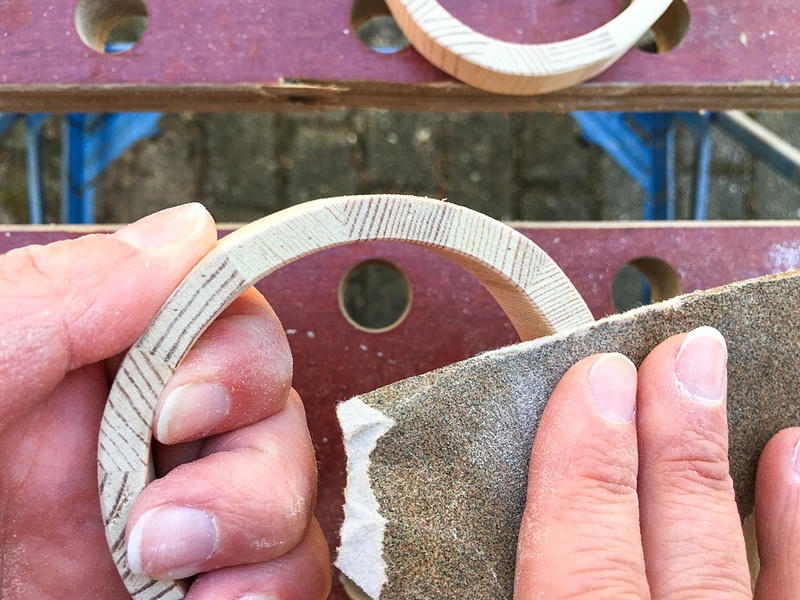 So even though at first sight the workshop didn’t have anything to do with art, it had everything to do with creativity and design principles. The teacher made the point that favourite accessories usually have a story and that anything handmade is more interesting because it automatically comes with a story. 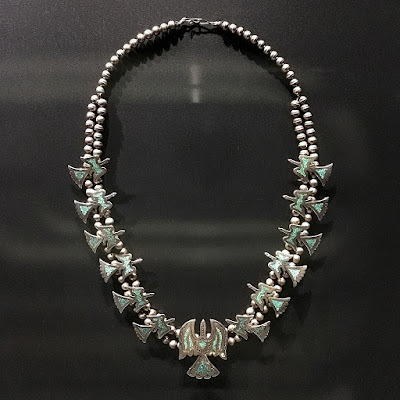 She mentioned an exhibition about jewellery in the Museum Volkenkunde, the National Museum of Ethnology in the Netherlands. This museum wasn’t high on my list of museums to visit, but I valued her opinion, and with accessories and the 'Stencil it! Wear it!' theme on my mind, I decided to give it a go. The cool thing about going to a museum that isn’t in your top 10 is that expectations are low and that you’re potentially in for pleasant surprises! And… I loved it! The jewellery exhibition started with a fascinating video installation of jewellery makers and collectors talking about their relationship with jewellery. 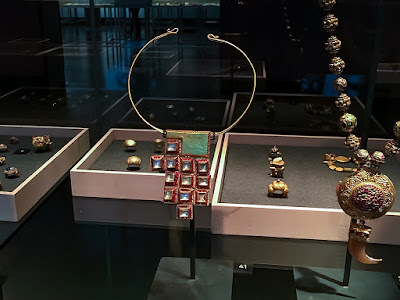 Which was followed by four jewellery sections: natural materials, silver, glass and gold, and video displays about the making of some of the jewellery. It was so interesting to see what kind of jewellery tickled my fancy most. I took a lot of photographs in the colourful glass bead section! 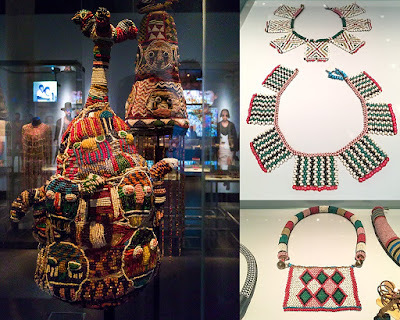 One of the unexpected takeaways for me was that I also learned stuff about jewellery and beads I already have at home. It makes me look at some of it in a whole different way. The rest of the museum is excellent too. I found lots of patterns that reminded me of StencilGirl® stencils! 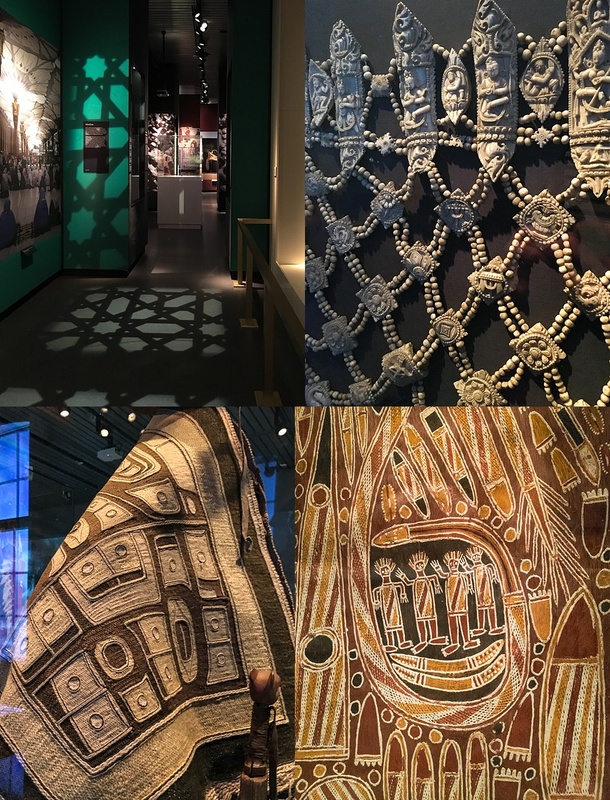 Because it’s a museum about cultural diversity, you get to see stunning craftsmanship, but also a lot of oddities and items that would seem bizarre if you don't have any information about the original context. 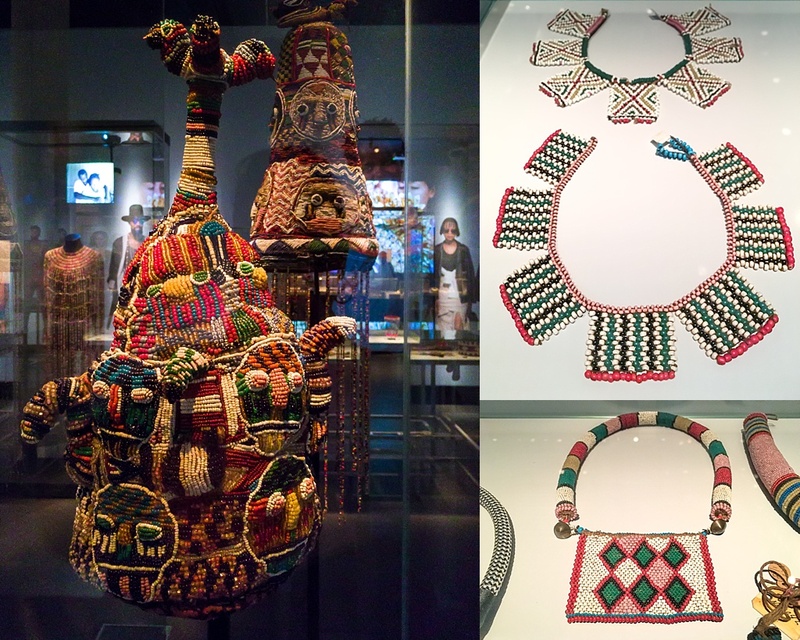 A lot of the time the tales behind objects (or why they're in the museum) aren't pretty. It's always good to learn more in that respect. Because of the jewellery expo, there was a lot of jewellery for sale in the museum gift shop. And of course, I couldn’t resist buying two woven recycled plastic bangles and one made out of wood. 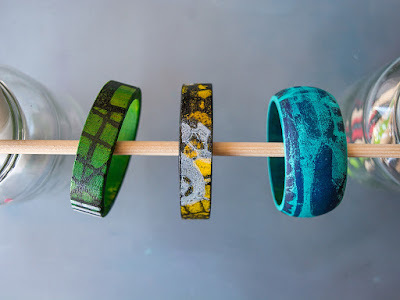 The wooden one reminded me of a couple of untreated bangles that I’ve had in my stash for way too long! I dug them out and asked my husband to saw the biggest bangle in two to make it wearable. I sanded all pieces before I stained them with a textile dye. I used Gelli Arts® gel printing plates to print a different pattern on each of the bangles. For the curved edged bangle, I rolled paint out onto a small gel printing plate and placed the Batik stencil on top. Next, I took a sheet of tissue paper, and I removed all of the paint from the stencil openings. 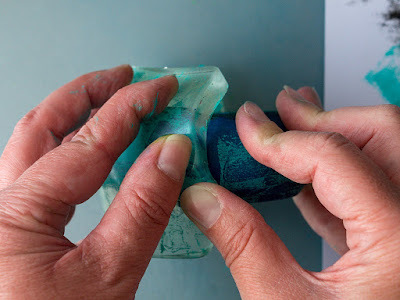 Then I curved the gel printing plate with my hand to follow the shape of the bangle. This way the paint could print on the rounded edge too. 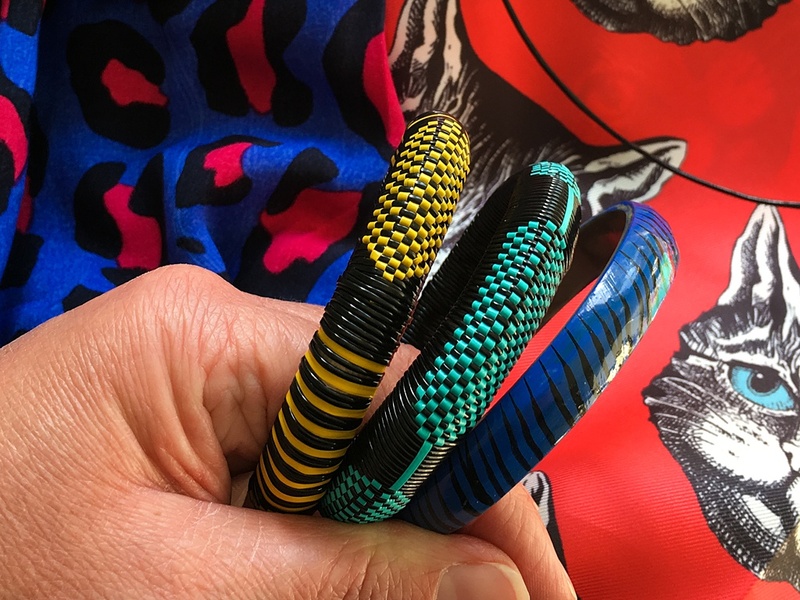 The process is the same for the bangles with the straight edges, but instead of curving the gel printing plate, I carefully rolled the bracelet over the flat-lying plate. 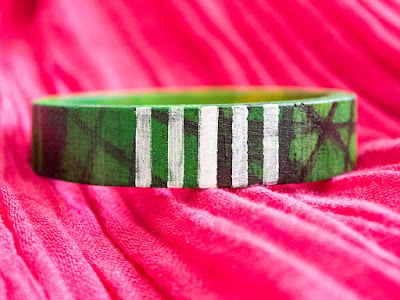 I used the Stitched 01 stencil on the yellow and the Shape Shifter stencil on the green bangle. 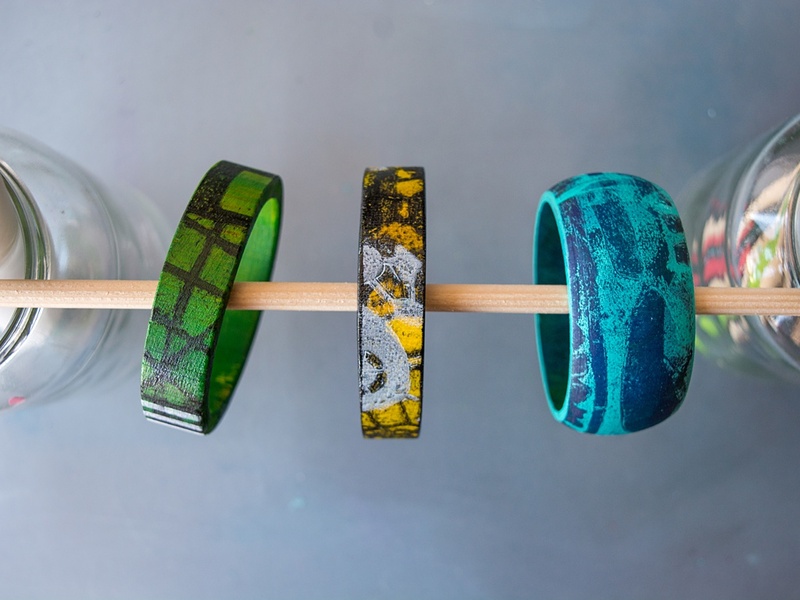 Once I was happy with the results I varnished the bangles and left them to dry. 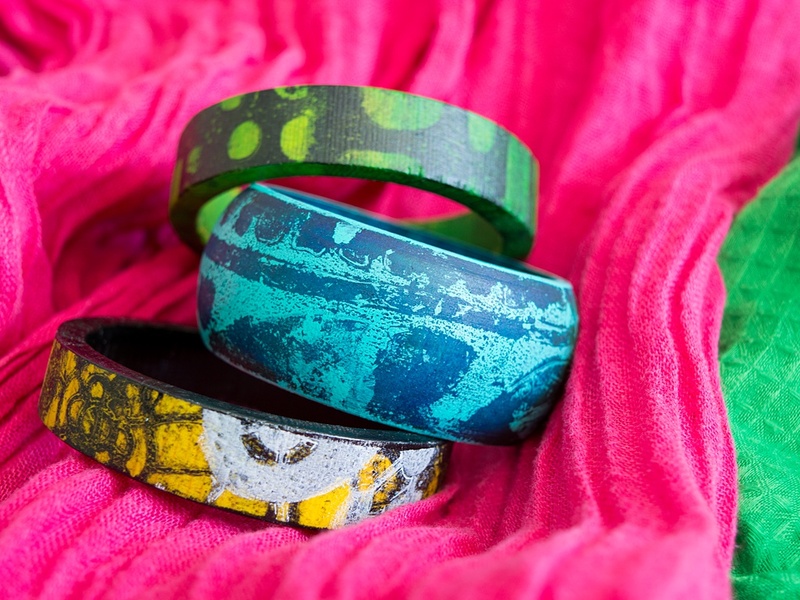 So now I have my very own handprinted bangles to commemorate my debut as a StencilGirl® Columnist, AND I know how to wear them too! Do you have favourite handmade accessories? Let us know in the comments! We would love to hear about them! 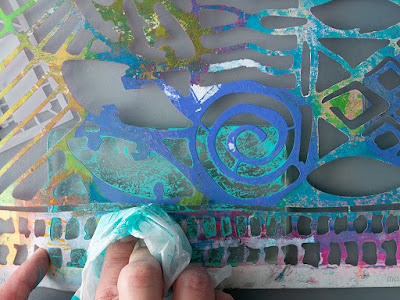 What an exciting new way to use my stencils and my Gelli plate! Thanks for the inspiration Marsha. Your beautiful bracelets have really ignited my desire to create some of my own! 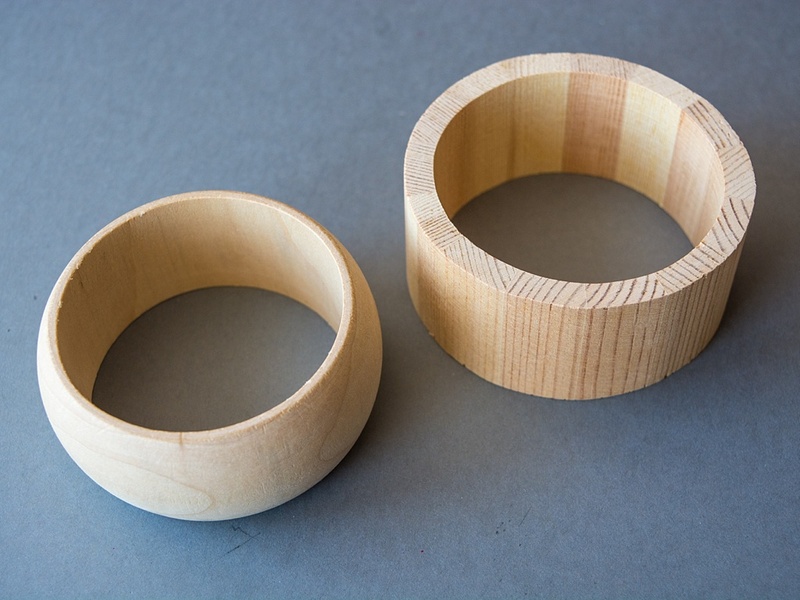 I went to AmazonSmile.com and found lots of unpainted wooden bracelets. 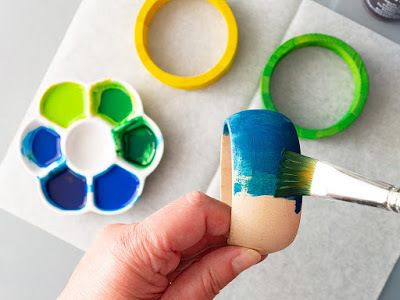 I can't wait to try this myself -- and I have your ingenuity and artistic skill to thank! I just finished painting 24 bangles. I used a stencil on some but never thought of a gelli plate! I loved your story of discovery! 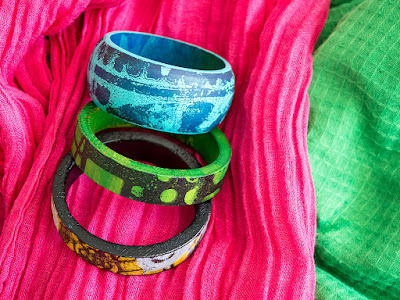 And I loved the results, as well - your beautiful bangles! Great job!